Academic Art of Riding is the effort to rediscover the European art of riding of the past centuries. Unlike in contemporary times, horses were mainly used in warfare, in agriculture and for transportation. A well educated horse was a precious commodity and, for example, a knight’s or soldier’s life would depend on it. From ancient times, people have taken great care to educate horses in a way that they will be healthy until old age. Already de la Guerinere (18th century) complained that the art of riding was getting lost and only very few masters wrote about it. Since then, the interest in a slow and thorough education of the horse has become less and less. For the big wars at the end of the 19th and the beginning of the 20th century, the cavalry demanded for a fast education of both horse and soldier, and with the invention of the automobile, more and more machinery, and tanks, the horse lost its use for the human. With the devastation and poverty of the years after World War II, owning and breeding horses became a luxury. If it had not been for the use of the horse in sports, its popularity would not have reached today’s heights. So apart from the historical background, what IS the Academic Art of Riding? First of all, it’s an education for the rider. We learn to educate our horse until high level dressage, from the ground as well as from the saddle. We learn to teach aids, to build up a communication, and to structure a training session. We learn to use our education tools: groundwork, lunging, work in hand, and riding. And we also learn to see correct movement and to understand the essence of training exercises. In the Academic Art of Riding, the seat is the primary aid. All other (secondary) aids are used to explain the seat to the horse: the hand, the rein, the whip, the leg, the voice. The goal is to ride the horse only from the seat, with reins in one hand. Second, it’s a training method. It starts with stretching forward down, bending and stepping under on the circle. The goal is to stretch and shape the upper line of the horse and then to make the horse’s hind legs more flexible and more able to carry weight. We start with the inside hind leg: stepping under on the circle and shoulder-in. Then we educate the outside hind leg in the quarter-in. In travers, the pirouette, and renvers, both hind legs have to take more and more weight. The shoulders will be enlightened, the horse will lift the rib cage and the neck, and it will move in self-carriage. Thus, we focus on the education of the hind legs, without too much manipulation of the head. Once the hind legs can take more weight, we start giving half halts, so that their joints will bend even more, leading to the collected gaits. In the Academic Art of Riding, we talk about “schooling” the gaits, so we develop a school walk (a very collected walk that can look like a piaffe on a picture), the piaffe, and the school canter (a very collected canter, as much as possible on the place, out of which the terre a terre can arise). But we also work with half halts in standing and thus develop the school halt, which can lead to the levade. 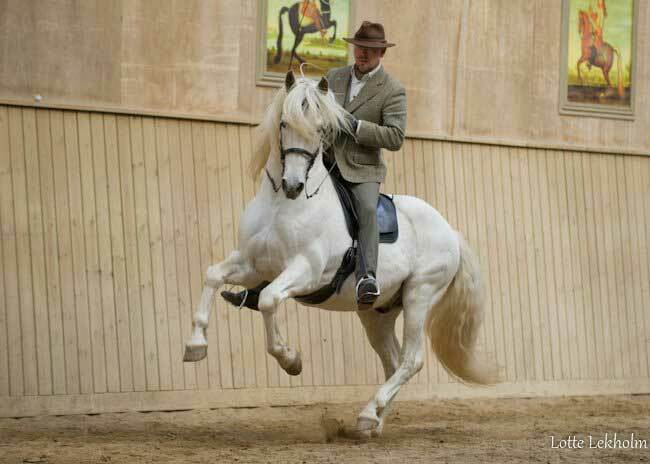 Very talented horses and riders can even reach the so-called airs above the ground, which are a further development of these exercises and not circus tricks: the ballotade, the croupade and the capriole. Thirdly, the Academic Art of Riding leads to more self-awareness, mentally and physically. We learn to be clear about our intentions and goals and how to communicate these to the horse. What we do not understand we cannot explain, which is why we value learning and never-ending self-improvement. Most often, the problem “sits in the saddle”; but if we find the exercises in our own body, the horse will follow. Respect for the horse’s body and mind is of the utmost importance. Thus, we have to give up our emotions of ambition and impatience and become a student of the horse. Fourth, it’s a great community of like-minded people. Many riders started in the Academic Art of Riding because of some kind of challenge: a horse with injuries, with mental problems, with a difficult body, or because they didn’t want to subject their horse to modern, tough training methods. They already did a lot of searching and self-questioning before they found the academic. Personally, I have never met so many inspiring, warm, open and knowledgeable people as in the Academic Art of Riding. Fifth, it’s a wonderful way of being with our horse. We have a great variety of tools at our disposal: groundwork, liberty work, work in hand, lunging, advanced lunging, the cross-over, the riding… we use what motivates us and our horses and what helps us to grow together more and more. There are no “dogmas”, we don’t have to do anything except spend a good time with our horse. Why else do keep we horses nowadays? Due to the training, our horses will become stronger and more balanced, which will lead to more confidence in themselves and also more trust to us. They will love being with us and we will truly look forward to their company. And last but not least, the Academic Art of Riding it is an art in which “two spirits must want to do what two bodies can.” (Bent Branderup). It’s about the melting of two totally different beings and creating a dance, full of lightness and harmony. Every artist is different, and every rider’s and horse’s path in the Academic Art of Riding is very individual. We might copy what we find inspiring in the beginning, but then we find our own way. When your horse follows the slightest shift of weight and a mere thought of an aid, when you both want to be the best you can be for each other, then you have a good chance of becoming a riding artist. This understanding of art is not limited to the highest levels of dressage – its already starts with the basics. Bent Branderup has dedicated his life to the rediscovery of the art of riding. In his youth, he travelled all around Europe to find the different riding masters. He learned from Don Francisco Javier Garcia Romero, Nuno Oliveira, and Egon von Neindorff. Apart from that, he also learned from books by the old masters, by studying history, and by analysing pictures, paintings and sculptures. He experimented with the theories of the different riding masters, educating, for example, one horse entirely according to Pluvinel (1555-1620). Today, he receives weeks students at his home in Denmark and travels all around Europe to give courses. Moreover, Bent absorbs the results of modern research into his academic art of riding, as well as the experience of his students. For a deeper study and understanding of the classical principles, he has found the knighthood of the academic art of riding, a consortium of his best students, of whom many are equally dedicated to the heritage of the old masters. Here is a short excerpt about the history of the academic art of riding. We do not know details about the education of riders in the ancient ages in the different countries of Europe. We can assume that the sophisticated education of a mounted warrior in most cases followed structures similar to those that applied for the education of a medieval knight. Here we find mastery, where the apprentice (the squire) is educated to become a knight. The knight was a nobleman and a professional soldier who committed himself to fight for his king, a task he could only fulfil after having received an adequate education and training. There was nothing wrong with the riding skills of the European culture, except the formulation of these skills. When this formulation began, the Academic Art of Riding started, combining theory with practice. This happened when, in Renaissance times, Europeans felt connected with the heritage of classical Greece and rediscovered the writings of Xenophon dating from the 4th century BC. The encounter with the Arabic world, where books on equitation were quite common and the education of mounted warriors was organised more effectively, might also have been important. When Byzantium was conquered by the Ottomans in 1453, and the Byzantine Empire declined, many scientists, artists and among them some riding masters fled to southern Italy, which at that time belonged to Spain. They seemed to have had great influence on the further development of the art of riding there. In Spanish Naples, Federico Grisone opened the first public riding academy in the year 1532. This earned him the name “The father of the art of riding”. A new system, “how to learn to ride”, had started to take shape. Now, a master could take in more than just one apprentice occasionally. In this way, the spirit of those masters became multipliable. The riding academies popped up like daisies, as did literature about riding. As long as kings actually led their troops into battles and fought with them, the goal of training horses was a very practical one. With Antoine de Pluvinel, the training in weaponry was as important as the dressage training, the latter was a necessary basic education. At the academies, not only riding was taught, but also everything else that was useful for a young man in Europe: foreign languages, philosophy, fencing and maybe other subjects. This way, riding academies became universities, and contributed greatly to the development of Europe. The Duke of Newcastle refined the thoughts of the academies and described the work around the single pillar in more details than Pluvinel. Due to the development of firearms, close combat on horseback became a rare occurrence and the training for it lost its purpose. Kings started to stay in the background during battles. This was the beginning of “recreational” equitation, when riding reached its highest level of perfection and, practised for the art (l’art pour l’art), became a very important part of court ceremony. These were the days of Gueriniere. Then cavalry schools started to teach recruits, instead of working with professional soldiers. The military academies had to find ways of training that could be used for recruits on ‘remonte’ horses- young horses used in the army, usually of agricultural breeds. It was in this perspective that exercises such as terre a terre and capriole disappeared, along with man-to-man battle techniques on horseback. The lives of recruits were cheap and war-tactics were adapted to the new circumstances. 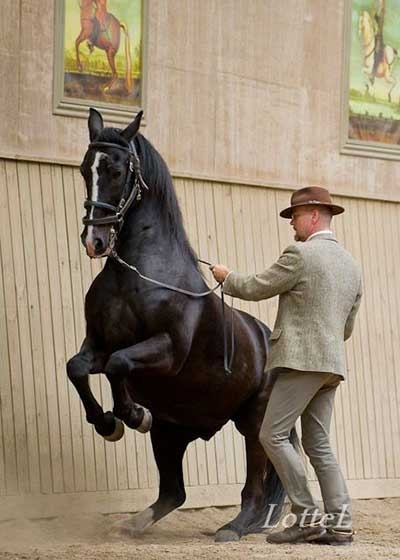 This was the start of a different way of equitation in which accordingly the wish was to have tall, forward-going horses.Then came Steinbrecht, who taught the officers how to keep speed and do gymnastic exercises with their horses at the same time. This made the officers the inheritors of the European riding culture. When the Polish cavalry fought the German Panzer attack at the beginning of World War II, the era of military officer’s equitation died. The horse seemed to have served its time and people believed that they could, and would, do gladly without horses. However, European culture and the European way of thinking seem to be connected closely to horses, more than we might perceive in the first glance. The whole European culture is based on four hooves, which we wished to feel moving underneath us again. We are part of this inheritance, one that has shaped our culture. Few activities are as good for shaping our character as being together with horses and training them. With the help of our horses, we can reach back to our roots. Nowadays more people want to learn the different ways of horseback riding than every before. They become thinking riders and so carry on the cultural inheritance of the riding academies. We have the horse that we love and we don’t have to do anything else than enjoying to spend time with this horse.